Just in case the Cabot Trail isn’t scenic enough for you, there’s an even more scenic alternate route that bypasses one of the Trail’s more monotonous sections. 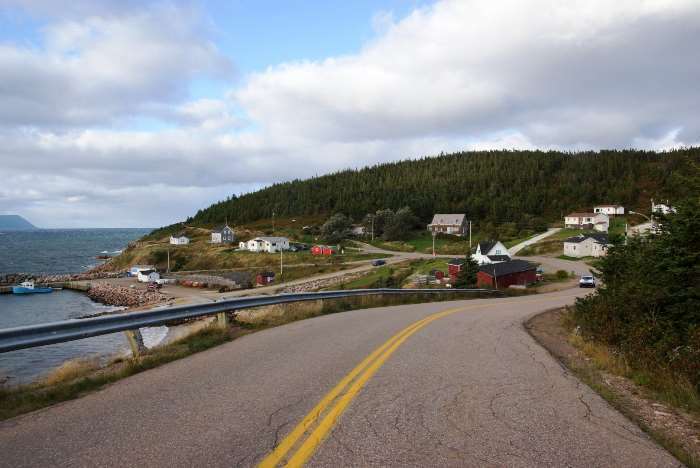 The Coastal Route accesses picture-perfect villages like White Point and Neils Harbour. It’s a curvy drive that’s slower than the Cabot Trail, but the views are worth it! Between Neils Harbour and Effies Brook, at the northern part of Cape Breton Island, the Cabot Trail stays inland, with limited scenic views. You can, instead, choose the “Coastal Route” between these two points. 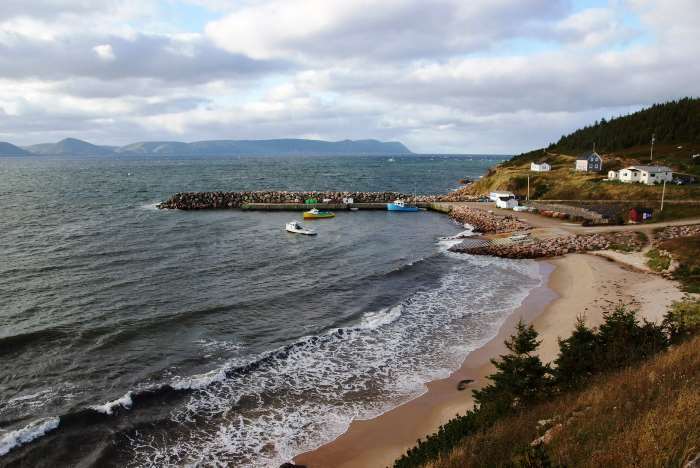 The Coastal Route heads north from Neils Harbour to New Haven and White Point, then west to Smelt Brook and Black Head, before returning to the Cabot Trail at Effies Brook near South Harbour. I drove the Coastal Route in the middle of some rain showers, as I neared the end of Day 5. Because of the rain, and because I wanted to make it to the western side of the island for sunset, I didn’t spend a lot of time on the Coastal Route. Instead, I figured I’d get back to it in the next few days — but I never did. So, the best way to see what’s there, is to watch the Drivelapse video, down the page. 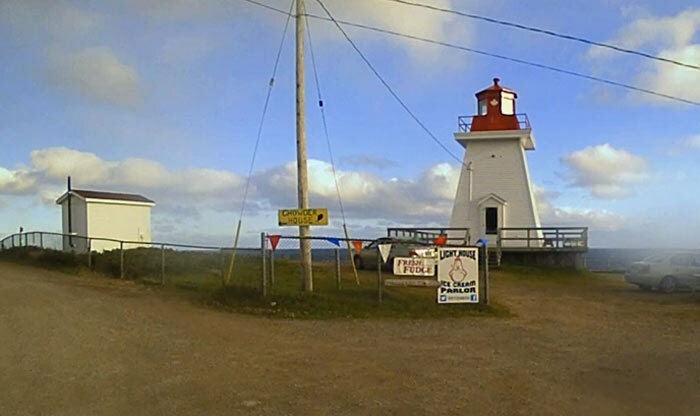 I didn’t stop in Neils Harbour, so this photo of the town’s lighthouse was taken with the Drivelapse camera. At the time, I didn’t think it was a “real” lighthouse, because it had an ice cream parlor in it. After some more research, I now know that the Neils Harbour Lighthouse is indeed “real”. There has been a light here since 1899. As you head north from Neils Harbour, you’ll pass a small side road that leads out to White Point. It’s worth your time to take this detour. This little community is beautifully perched along the edge of the water. The road runs alongside a cliff, giving you a view of the town. The road ends just up ahead, with just enough room for two or three cars to park. If you can squeeze into a spot, you can continue north on foot up the peninsula, to the actual White Point (the geographical feature, as opposed to the village). I intended to return to this spot and hike it, but I ran out of time. You’ll have to backtrack from White Point to the main road, and then continue following it back to the Cabot Trail. The road stays close to the coast throughout the drive, giving you some great views along the way. You can see all of it in the Drivelapse video below. The Coastal Drive is a great scenic alternative to the Cabot Trail in this area. Allow for plenty of time for sightseeing in Neils Harbour and White Point, as well as the hike in White Point, if you can grab a parking spot.